Preface In presenting to the public this selection from the sermons of Bourdaloue, the translator has found it no easy task to express in clear and idiomatic English the well-balanced periods of the original. He hopes, however, that he has not entirely failed to convey to his readers some idea of the author’s style, and, what is of more consequence, that the translation, such as it is, is not an unfaithful rendering of the author’s impressive words. The little that is known of the life of Bourdaloue is so familiar to all who are interested in such matters, that it is not necessary to repeat it here, As an orator, Bourdaloue was clear, antithetical, harmonious; his learning was wide, and he always handled his subject in a masterly way. In his references to the Fathers, it is not so much their very words, as their teaching and their arguments, which he reproduces in a modern form. But we do him an injustice if we regard him merely as an able reasoner. It has been well said that he was “one who valued a victory over the heart of the humble listener, more than over the judgment of the man of taste.” There is one point which must strike those who read these sermons on the Passion; the preacher never permits us to lose sight of the great truth, that the sufferer is God. Keeping in view the impersonality of the Saviour’s Manhood, Bourdaloue does not shrink from saying, that it is a God who suffers, a God who is being tortured and crucified, a God who is dying. 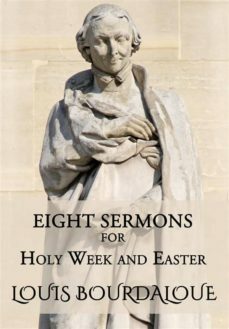 These eight sermons, most of which were preached before the French Court, will be found to be remarkable alike for their originality and completeness. The translator hopes they may be an aid to the better understanding and the deeper realization of the august mysteries of which they treat. I may add that in this translation the texts of Holy Scripture have generally been quoted from the A.V., except when the rendering of the Vulgate materially differs from it, in which case attention is called to the fact in a footnote. G. F. C. ST. LUKE’S, SOHO. 1884.